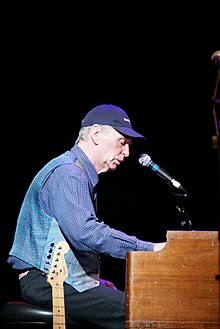 Georgie Fame (born Clive Powell; 26 June 1943) is an English rhythm and blues and jazz singer and keyboard player. Fame, who had a string of 1960s hits, is still a popular performer, often working with contemporaries such as Van Morrison and Bill Wyman. Fame is the only British pop star to have achieved three number one hits with his only Top 10 chart entries: "Yeh, Yeh" in 1964, "Get Away", in 1966 and "The Ballad of Bonnie and Clyde" in 1967. Fame was born in Leigh, Lancashire. He took piano lessons from the age of seven and on leaving Leigh Central County Secondary School at 15 he worked for a brief period in a cotton weaving mill and played piano for a band called the Dominoes in the evenings. After taking part in a singing contest at the Butlins Holiday Camp in Pwllheli, North Wales, he was offered a job there by the band leader, early British rock and roll star Rory Blackwell. At sixteen years of age, Fame went to London and, on the recommendation of Lionel Bart, entered into a management agreement with Larry Parnes, who had given new stage names to artists Marty Wilde and Billy Fury. Fame later recalled that Parnes had given him an ultimatum over his forced change of name: "It was very much against my will but he said, 'If you don't use my name, I won't use you in the show'". Over the following year Fame toured the UK playing beside Wilde, Joe Brown, Gene Vincent, Eddie Cochran and others. Fame played piano for Billy Fury in his backing band, the Blue Flames. When the backing band got the sack at the end of 1961, the band were re-billed as "Georgie Fame and the Blue Flames" and went on to enjoy great success with a repertoire largely of rhythm and blues numbers. 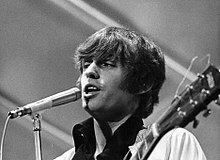 Georgie Fame and Rick Brown performed in Amsterdam in October 1966. Fame was influenced by jazz, blues, and the musicians Mose Allison and Willie Mabon. He was one of the first white musicians to be influenced by ska after hearing it in cafés in Jamaica and Ladbroke Grove in England. He recalled The Flamingo Club was "full of American GIs who came in from their bases for the weekend" who played for him the song "Green Onions" by Booker T. & the M.G.'s. "I had been playing piano up to that point but I bought a Hammond organ the next day." In 1963 the band recorded its debut album, Rhythm and Blues at the Flamingo. Produced by Ian Samwell and engineered by Glyn Johns, the album was released in place of a planned single by EMI Columbia. It failed to reach the chart, but the October 1964 follow-up, Fame at Last, reached No. 15 on the UK album chart. Ronan O'Rahilly failed to get Fame's first record played by the BBC. After it was rejected by Radio Luxembourg, he announced he would start his own radio station to promote the record. The station became the offshore pirate radio station Radio Caroline. Fame enjoyed continual chart success, with three number one hits in the UK Singles Chart. His version of "Yeh, Yeh", released on 14 January 1965, spent two weeks at No. 1 on the UK singles chart. "In the Meantime" charted in both UK and US. Fame made his US television debut that same year on Hullabaloo. His single "Get Away", released on 21 July 1966, spent one week at No. 1 on the UK chart and 11 weeks on the chart. The song was written as a jingle for a petrol commercial. His version of the Bobby Hebb song "Sunny" made No. 13 in the UK charts in September 1966. His greatest chart success was in 1967 when "The Ballad of Bonnie and Clyde" became a number one hit in the UK, and No. 7 in the US. "Yeh, Yeh" and "The Ballad of Bonnie and Clyde" sold over one million copies and were awarded gold discs. Fame continued playing into the 1970s, having a hit with "Rosetta" with his friend Alan Price of the Animals in 1971, and they worked together extensively. In 1974, he reunited the Blue Flames and began to sing with European orchestras and big bands. He wrote jingles for radio and TV commercials and composed for the films Entertaining Mr Sloane (1970) and The Alf Garnett Saga (1972). He became a member of Van Morrison's band, as well as his musical producer. He played keyboards and sang harmony vocals on "In the Days Before Rock 'n' Roll" from the album Enlightenment while recording and touring as a solo act. He played organ on Van Morrison's albums between 1989 and 1997 and starred at Terry Dillon's 60th-birthday party on 10 May 2008. Morrison refers to Fame in the line "I don't run into Mr. Clive" in his song "Don't Go to Nightclubs Anymore" on the 2008 Keep It Simple album. Fame appeared as a guest on Morrison's television concert presented by BBC Four on 25 and 27 April 2008. Fame was a founding member of Bill Wyman's band Rhythm Kings. He also worked with Count Basie, Eric Clapton, Muddy Waters, Joan Armatrading, and the Verve. Fame has played residences at jazz club Ronnie Scott's. He played organ on Starclub's album. He was the headline act on the Sunday night at the Jazz World stage at the 2009 Glastonbury Festival after performing at the Midsummer Music at Spencers festival in Essex. On 18 April 2010, Fame and his sons Tristan Powell (guitar) and James Powell (drums) performed at the Live Room at Twickenham Stadium for the tenth birthday celebrations of The Eel Pie Club. Part of the proceeds from the concert benefitted the Otakar Kraus Trust, which provides music and voice therapy for children and young people with physical and mental difficulties. The trio performed later that year at the Towersey Festival. In 1972, Fame married Nicolette (née Harrison), Marchioness of Londonderry, the former wife of the 9th Marquess. Lady Londonderry had given birth to one of Fame's children during her marriage to the marquess; the child, Tristan, bore the courtesy title Viscount Castlereagh and was believed to be heir to the marquisate. When tests determined the child was Fame's, the Londonderrys divorced. The couple had another son, James, during their marriage. Nicolette Powell died on 13 August 1993, after jumping off the Clifton Suspension Bridge. In an interview before her death, Fame said that they had stayed happily married because of her "charm, beauty, forbearance and understanding". Fame supports Countryside Alliance and has played concerts to raise funds for the organisation. ^ a b Roberts, David (2006). British Hit Singles & Albums (19th ed.). London: Guinness World Records. p. 194. ISBN 1-904994-10-5. ^ Johnny Gunnell, cover liner notes on Rhythm and Blues at the Flamingo, Polydor RSO, SPELP80. ^ "The Offshore Radio Revolution in Britain 1964 - 2004 - Edited Entry". h2g2.com. 31 October 2004. Retrieved 25 February 2019. ^ "UKMIX – Articles – Chart Of All Time – 1966". ukmix.org. Retrieved 10 January 2015. ^ "Georgie Fame". 45-rpm.org.uk. 26 June 1943. Retrieved 29 June 2014. ^ Murrells, Joseph (1978). The Book of Golden Discs (2nd ed.). London: Barrie and Jenkins. pp. 174, 220. ISBN 0-214-20512-6. ^ "Spencers – Spencers Events". Spencersgarden.net. Retrieved 29 June 2014. ^ "Yeh Yeh Georgie Fame at the Live Room". Richmond and Twickenham Times. 19 April 2010. Retrieved 25 February 2019. ^ "Eel Pie Club". Eel Pie Club. Retrieved 29 June 2014. ^ "Henley on Thames News | Concert for Festival featuring Georgie Fame". Henleystandard.co.uk. Archived from the original on 22 August 2014. Retrieved 29 June 2014. ^ "Line Up – Cornbury Music Festival". Cornburyfestival.com. Retrieved 29 June 2014. ^ Walker, Tim (13 September 2012). "Annabel Goldsmith prepares joyful celebration for the late Marquess of Londonderry". The Telegraph. Retrieved 7 January 2019. ^ Singh, Anita (30 March 2014). "Sale of the century as aristocrats auction heirlooms". The Telegraph. Retrieved 7 January 2019. ^ "High Society: Whatever happened to the last of the debs?". The Independent. 24 September 2006. Retrieved 7 January 2019. ^ "Pop star's wife died in fall from bridge". The Independent. 24 August 1993. Retrieved 7 January 2019. ^ "Bryan Ferry to play Countryside Alliance Benefit Concert". Wikimedia Commons has media related to Georgie Fame.